Location: Pennautier, in the Aude departement of France (Languedoc-Roussillon Region). Notes: Château de Pennautier is located in the town of Pennautier in the Aude department in Languedoc-Roussillon, 5 km from Carcassonne and 90 km from Toulouse. 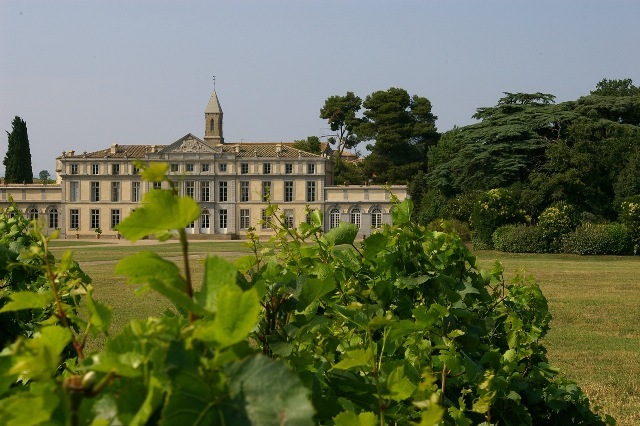 This important vineyard is a historical monument.The Château de Pennautier, (nicknamed the Versailles of Languedoc), was built in 1620, at the end of the religious wars, by Bernard Reich Pennautier, Treasurer of the States of Languedoc. On 14 July 1622, the castle hosts the young King Louis XIII en route to Perpignan and Bernard Pennautier, chief magistrate of the city, "pronounced the speech" Home. Without knowledge of the exact reason for this gift, the king gives the castle its "journey furniture" valuable set covered with fine tapestries in wool and silk floss, with a canopy bed and 6 chairs with tapestry can bend to travel without doubt in the trunks. This furniture, listed building, is still carefully preserved in the "King's Chamber." Nicolas Lorgeril, his grand-son, takes the responsibility Castle in 2000 after his parents. With his wife Miren de Saint Chamas, they attack a complete renovation of the building and on this occasion, all the archives of the castle (about 15 m library) has been entrusted on deposit in the departmental archives of Aude who will reap new historical insights. The castle was completely renovated recently and become a host of events held (weddings, parties, dinners ...) and work or business conference meetings. It is the seat of fields and vineyards Lorgevil. The site was registered historic building March 10, 1972 and the castle including its interior decoration March 2, 1989.